Just a background, we’re pretty sure you’ve heard about the Anna Banana song that turned into a viral LSS a couple of months back. Finally the girl replies! Derek’s family came to the rescue and supported him! Watch the complete story here. Unfortunately Anna don't like Derek one bit! So sad:-( Derek is heartbroken. Haist!! Puppy love how cruel can you get? But wait we can do something about it, right dear readers? As for me, I would like to see Derek with Jill Robredo in the next PLDT Commercial! I saw on a TV clip that Jill, wanted to be the next Kris Aquino, and starting as Derek's New Anna will be a nice start, right peeps? Jillian Therese "Jill" Robredo is the youngest daughter of the late Interior Secretary Jesse Robredo and Attorney Leni Gerona-Robredo. Jill is pretty and bright. She is very talented especially in Math. She got her love for numbers from her dad. She is also a very good swimmer. 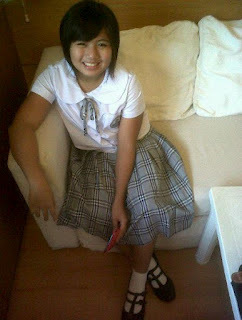 "I am already 12 and in my first year in high school at the Naga City Science High School. I will continue discovering myself and my talents and work hard at them. I am excited at what the future will bring" quips Jill. You my readers can also help Derek find a new ‘Anna’! Be Derek’s Next Anna by going to www.dereksnewanna.com. All YOU have to do is submit a video entry on why YOU should be Derek’s new Anna! If you win, you’ll be part of the next PLDT myDSL commercial and also take home a Samsung Ultrabook. How cool could that be?